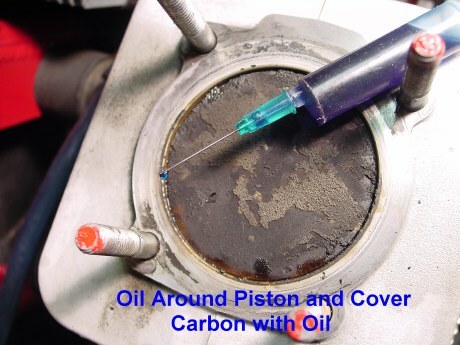 Lately, I have received letters from different pilots asking me about how to clean the carbon deposits on the piston and the cylinder head. Today, when I performed just this on my engine, I took pictures step by step and I hope, the following will answer those questions sent to me. 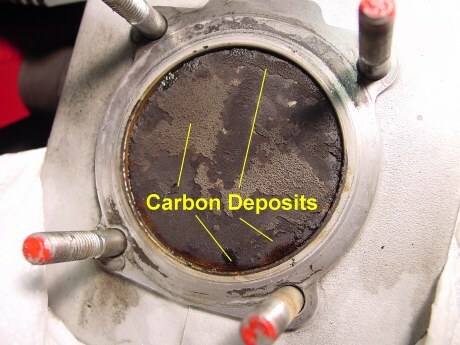 Before we start, I would like to mention that by decarbonizing an engine (term that I will use) I mean cleaning the carbon deposits from the piston, cylinder head and exhaust port. 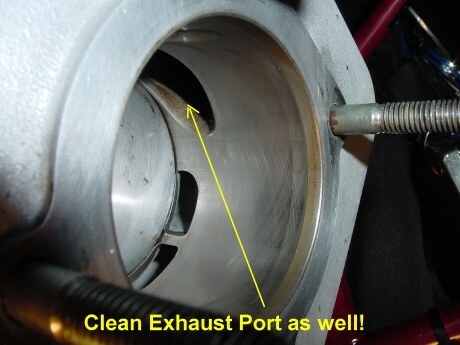 Two stroke engines develop more deposits than four strokes due to the fact that the combustion is not as good and clean as in four stroke engines. 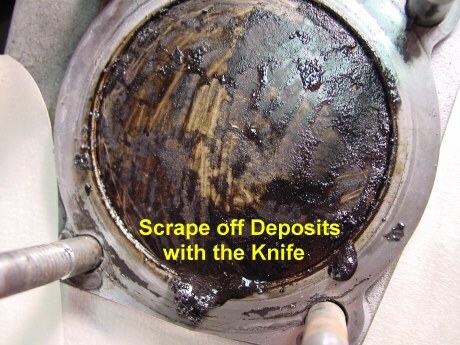 The amount of carbon deposits is determined by the oil/fuel mixture, air/fuel mixture, type and percentage of oil used, cylinder porting and fuel additives. The process was performed on the Cors-Air engine of my personal AIRFER Tornado machine. I have flown this engine for over 300 hours with no problems whatsoever . I did only preventive maintenance on it. 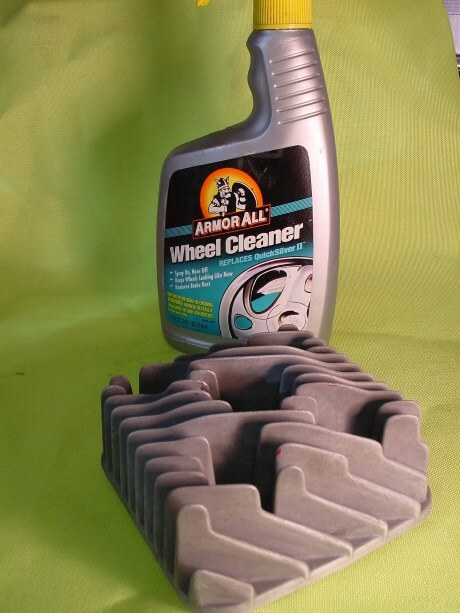 About every 70-80 hours, I open the cylinder and I clean all deposits. 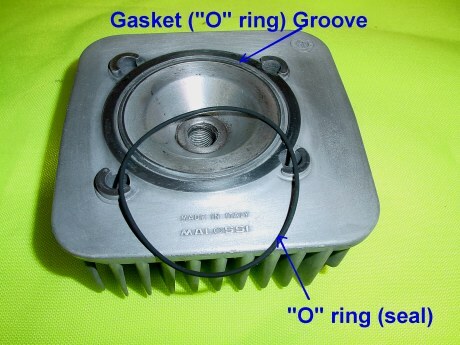 This operation is very important for a two stroke engine (especially used in flight) If the carbon accumulation is substantial, the deposits will start peeling and they may score the cylinder or piston. 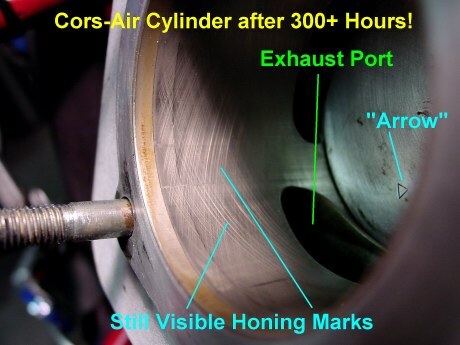 Although this operation was performed on a Cors-Air engine, it can be done on other engines as well. Remove the high voltage cable, spark plug, Cylinder Head Temperature probe (if existent). 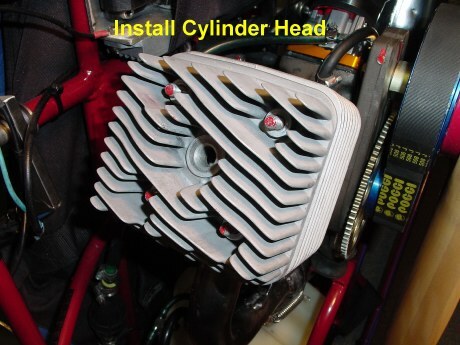 Remove the four (sometimes six) cylinder head nuts and HOLDING the cylinder on the bottom (pushing it against the crankcase) pry off the head with a piece of wood inserted between the head and the top of the cylinder. Holding down the cylinder is essential because otherwise, we can damage the seal under the cylinder and cause an air leak. 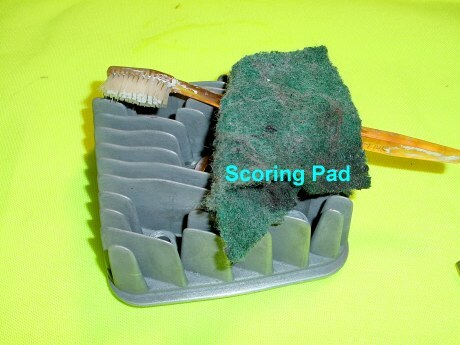 In order to clean the already soaked carbon deposits I use an old toothbrush, green scoring pads and a round ended knife. For removing the deposits from tight corners I use a small screwdriver. 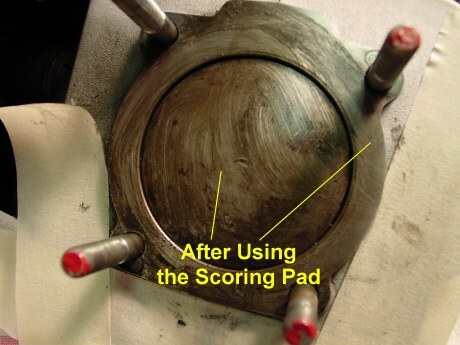 Care must be exercised NOT to scratch the head and especially its rim where the gasket or the "O" ring is installed. 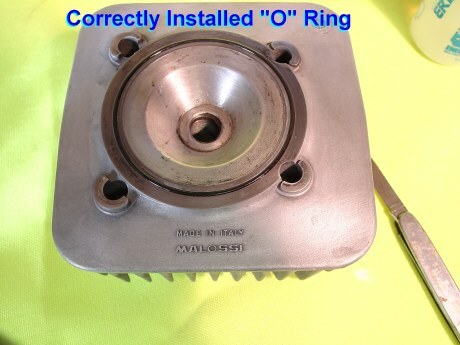 In this case, since we have a Cors-Air engine, instead of a gasket there is an "O" ring which is very efficient if the head is torqued properly. 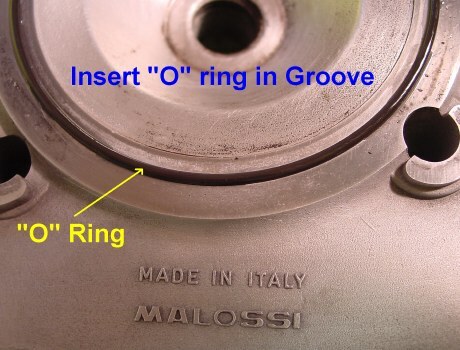 Engines like RDM or Simonini, also have an "O" ring. 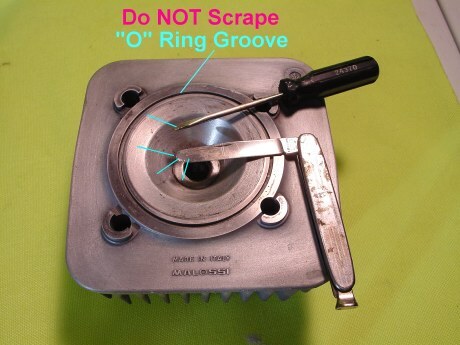 Please, do NOT scrape the "O" ring groove which usually will not have deposits anyway. Scoring the groove may cause a leak! 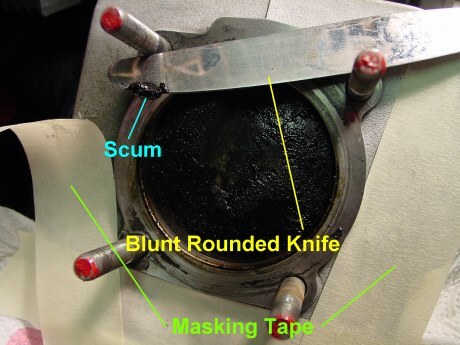 Once the head is clean, we concentrate on the piston, cylinder and exhaust port. 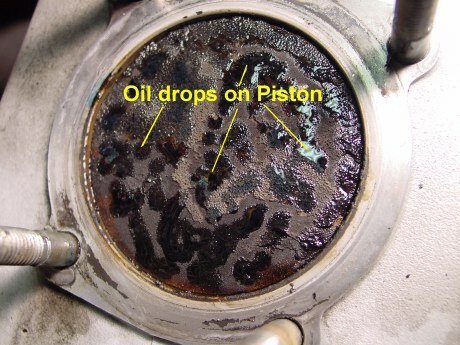 The top of the piston, as seen below, has lots of deposits. 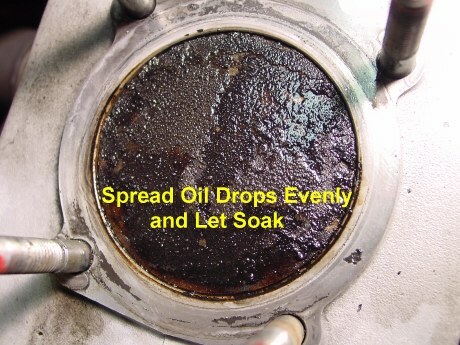 In order to prevent the removed particles to get in between the cylinder wall and piston, I strongly recommend putting a generous amount of 2 stroke oil in the round gap between the piston and the cylinder. This film will act like a trap. I use a syringe for this procedure. Once we seal the round gap, we apply drops of oil on the piston head. Next, we evenly spread the oil film and let soak for 15-20 minutes without any scraping. To scrape the deposits a BLUNT knife with a rounded end can be used. b After most of the deposits are removed, we soak a scoring pad with 2 stroke oil and Starting Fluid and continue the cleaning. The fluid contains Ether which is an excellent cleaner. 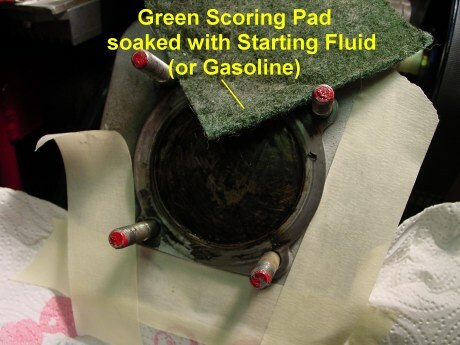 After using the scoring pad and removing all the deposits we can wipe the piston head with a paper towel soaked in Starting Fluid or clean gasoline. to prevent the dirt traveling too deep inside. This is important since if the deposits enter the transfer ports, it will be difficult for us to remove them. They will be sucked back into the cylinder and may score it or the piston!After cleaning, we turn the crankshaft (propeller) to lower the piston and we wipe off all particles trapped in oil. This operation should be done a few times with oiling in between. 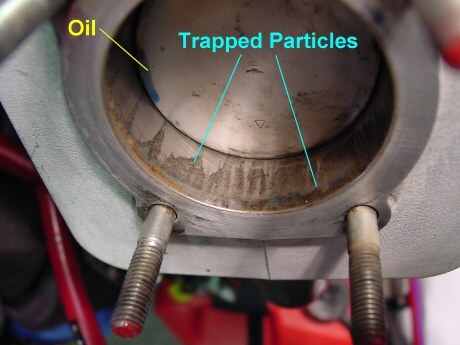 No visible particles should be left inside the cylinder. 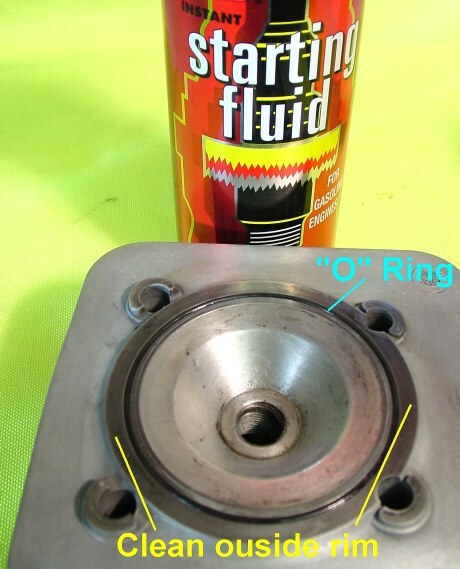 The picture below shows the cylinder after cleaning. so we can have better access to the port (not shown in this article) Now we can add a solution that will help removing light deposits from the piston. It is called Yamaha Ringfree. I have never used this compound and it was suggested by one pilot after this article was published. Please follow the instructions on the label. The next step is to install a new "O" ring on the head. 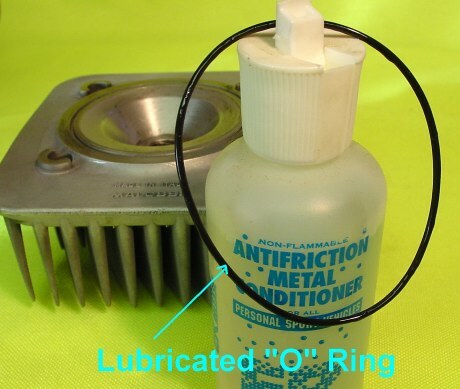 For a better seal, I use a high viscosity oil and apply it to the whole surface of the "O" ring. using not tools but fingers. From my experience I can tell that in most cases, the "O" ring will NOT sit properly. Once it is in the groove, I use a blunt object to further press it down. 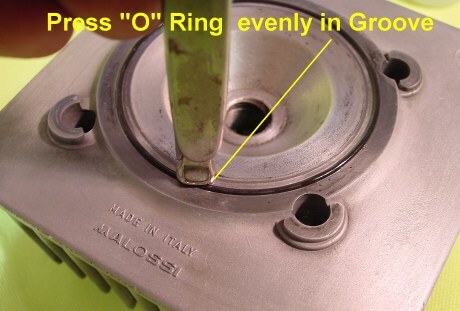 The correctly seated seal ("O" ring) will be evenly buried in the groove. on the cylinder nuts and after a flight, the cylinder head was leaking. 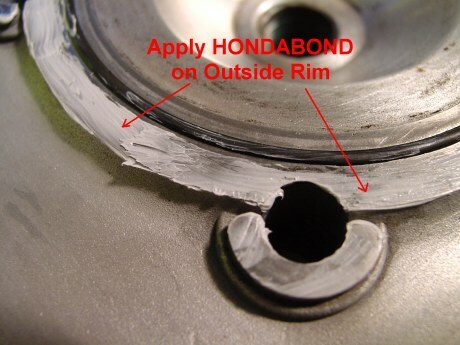 To prevent this or better, to retard this, I use a HONDABOND High Temperature Sealer available at any Honda dealer. This sealer is rated up to 600 F and can be used under the exhaust manifold gasket (which I do) It is expensive but well worth the money. The sealer will bond only to a completely dry and free of grease surface. I remove the oil from the outside rim of the head using a paper towel soaked with Starting Fluid. Care must be taken not to wipe the "O" ring with this solvent!!! Now we are ready to apply the sealer on the outside rim. 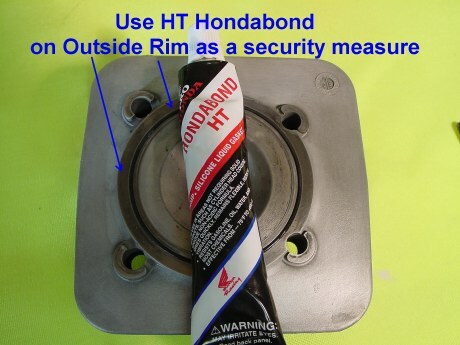 Honda stresses that only a SMALL amount of sealer needs to be applied. The picture below shows this. Before setting the head on the cylinder we apply sealer to the cylinder rim as well. 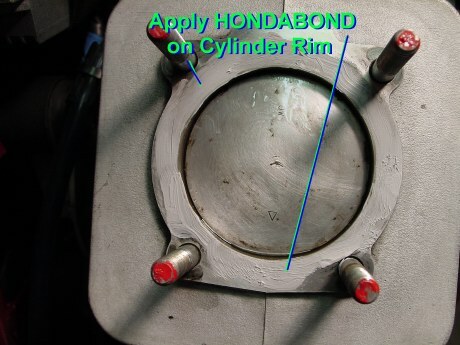 Before setting the cylinder head, wait about one minute to let the sealer (Hondabond) become tacky. We insert the head and push it evenly down until a contact with the cylinder is achieved. Once this done, we can install the washers, the SPRING WASHERS and the nuts. Please follow the torquing sequence on the bolts found in your engine's owner's manual. Note: The spring washers are very important because they will prevent (in most cases) the nuts from becoming loose. 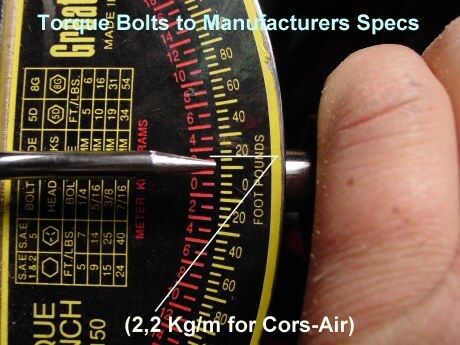 Next, we torque the bolts to the manufacturer's specs.In Case of the Cors-Air M21Y engine, the value is 2,2 Kg/m. After a few hours we need to recheck the torque on the nuts and later, we check them after 10-15 hours.Cylinder head nuts are known to become loose due to vibration. 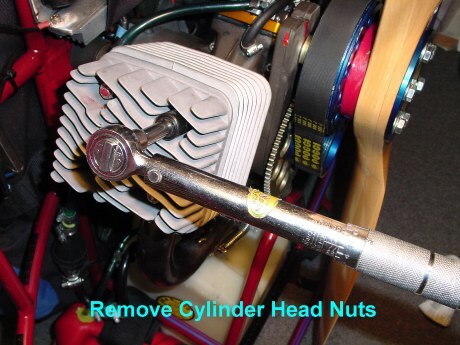 If the head starts leaking, retorquing the nuts may NOT stop the leak. Note: I would also recommend that the torque value on the nuts be checked on new machines as well, according to the manufacturer's maintenance specs!